MYTH: It's hard to get enough protein on a plant-based diet. FACT: There is so much fuss over "getting enough protein," but virtually all Americans (including vegans!) get way more than enough protein. Plant protein is complete, and the idea that vegans need to "combine foods" to get enough protein is a myth. MYTH: You'll get weak and frail on a vegan diet. FACT: There are vegan NFL players, MLS players, parkour athletes, and world champion power lifters that perform at the highest levels. Men's Fitness magazine named plant-based athlete Rich Roll, one of our contributors, one of the fittest men in the world. MYTH: Only rich people can go vegan-it's just too expensive. 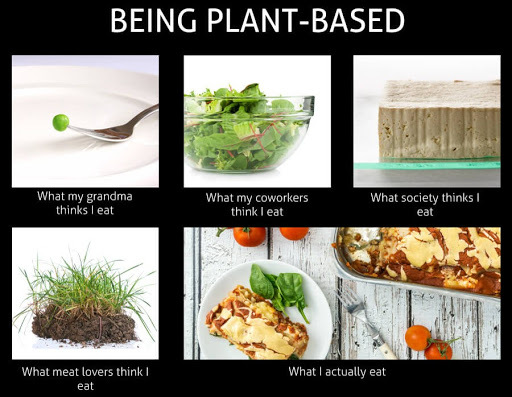 FACT: It's easier to eat plant-based on a limited budget than it is to eat a meat-centered diet. Staples like grains, potatoes, bananas, and beans are some of the cheapest (and healthiest) things you can buy in the supermarket. FACT: The Dairy Council tells us that we need to drink milk for strong bones, but there's no evidence that this is true. In fact, hip fracture rates (an indicator of osteoporosis) are actually highest in countries with the highest intakes of dairy products and animal protein. MYTH: My 85-year old grandma (or uncle, friend, etc) loves meat and is alive and healthy. That's proof that meat is healthy. FACT: We are happy that your friend or relative is healthy and we hope they live a long and healthy life. However, looking at large populations (and not individuals), research shows us that the longest-living populations in the world thrive on plant-centered diets.